We all know very well that how rapidly science has evolved and due to its advancements, technologies have also evolved enormously. 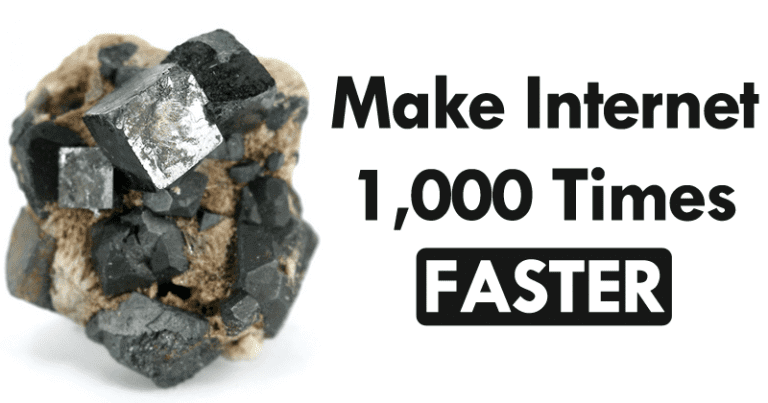 As recently, scientists have discovered a rare mineral that can simply make our internet 1,000 times faster. The perovskite is fashionable in scientific research to find the perfect triad of electricity: low cost, long duration and efficiency. The perovskite, as the scientist Gustav Rose called it when he discovered it in the Ural Mountains, Russia, in 1839, is a calcium titanium oxide mineral. But according to Forbes magazine, its magic lies in the ability to hold many cations (ions with different positive charge) in its physical structure, giving engineers the ability to modify the mineral as they see fit. And while scientists have known about the mineral for a long time, researchers continue to find it useful. In the world, the perovskite has been found in the mines of Arkansas, the Urals, Switzerland, Sweden and Germany, and each variety is slightly different. For example, in 2009, their ability to absorb sunlight and generate electricity was discovered. A natural form of a solar cell. Currently, the ore is in development for use in solar panels, screens and alternative car engines. It’s so promising that Spectrum magazine called it “The new black in the solar world”: “I do not know of any group that works with photovoltaics that is not with perovskite,” said Herny Snaith, a physicist at the University of Oxford, England, and one from leaders in the field of energy, to the magazine. According to Trevor Nace, a geologist and founder of the journal Science Trends, in the Forbes magazine, scientists have recently discovered the virtue of the mineral for transferring data through terahertz radiation. The most surprising thing is that, since it is a mineral that in a few words “absorbs light”, it uses that light instead of electricity to transfer that data, which allows speeds 1,000 times faster than those of current technology. Let’s go back a moment. The radiation frequency in terahertz is still a research, but it is known that the band is between infrared light and radial frequency (between 100 and 10,000 gigahertz). This compared to the 2.4 gigahertz range of today’s cell phones. Layered perovskite ore can transfer data through light waves in the terahertz band using a relatively inexpensive mechanism: halogens. Using a halogen lamp, the team of scientists discovered that they could modify these waves while passing through the perovskite. So they encoded the data in waves and transferred it 1,000 times faster. According to Nace’s research, in Forbes magazine, it had already been discovered how to modulate perovskite waves. However, that required a high-energy laser, so making it commercial was too expensive. This new discovery uses simple homemade halogen bulbs. As a curious fact, the scientists found that they can “modulate” the colour of the light to modulate the data. Then, they not only discovered how to transfer data 1,000 times faster using terahertz waves, but they can activate several transfers at the same time. “This technological breakthrough opens the door to the use of terahertz data transfer in computing and future generation communication. A thousand times faster, this cheap and easy way to transfer data presents a multitude of opportunities to transform our digital lives. Unfortunately, we will have to wait at least 10 years until it is commercially ready according to the authors. When that time comes, this could present a radical change in computing and communication,” writes Trevor Nace.